To Illuminate can mean to make something brighter and lighter, or it can mean to make something clearer or more understandable. Electric Dreams explores both of these meanings of illumination and makes the relationship between light and thought tangible and visible. The private and fleeting daydreams of the dreamer are transformed into a shifting and ephemeral display of light and color. EEG electrodes monitor the dreamer’s brainwaves. This signal is read by a custom microcontroller circuit, which amplifies and interprets the electrical signals of the brain to control shifts of color via red, green, and blue light emitting diodes embedded in the hand-molded felt headdress. 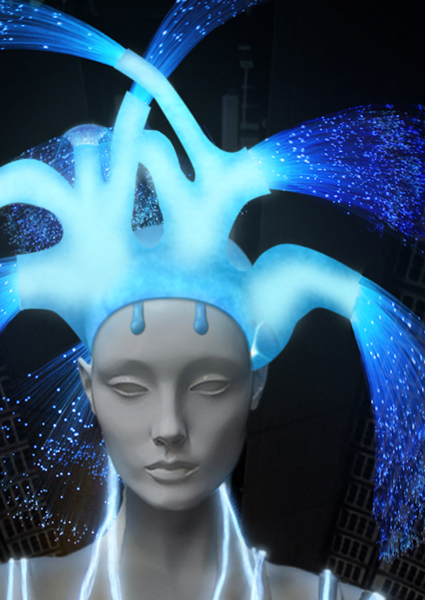 End-lit fibre optic cables transport the led light through the headdress. This light and color becomes a visible extension of fleeting thought processes. Side lit fibre optics carry these light impulses into the body of the garment to emphasize the distributed and networked nature of the nervous system throughout the skin of the body, not just the head. The design of the garment and headdress is based on the universal archetype of the tree of life. This tree, like the dream-state, represents a doorway into alternate realities; a threshold between the earth and the sky; the known and the imagined; waking and dreaming.